Northampton Town manager Chris Wilder says he cannot see his side faltering as they sit 11 points clear at the top of the League Two table. After a club-record 10 straight league wins, they have drawn their last two. "We're in a fantastic position - but anything can happen in a week of football, there's nine points to play for," said Wilder. "Other teams have got to go on great runs to catch us and we've got to have a dip, but I don't see it." Wilder told BBC Radio Northampton: "I'm not seeing any nervousness or apprehension in our play - we're going for it and enjoying this situation. "Will we win the next 12 games? I think it's going to be a real difficult task because to win three games on the bounce is tough. When you're talking about the exposure we get, we should do, because it's a special run, breaking club records." 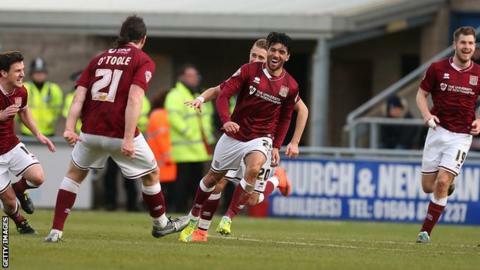 The Cobblers travel to play-off-chasing Carlisle on Saturday, after draws against Hartlepool and AFC Wimbledon. And Wilder says that, because teams below them all play each other, they will struggle to put together a run of wins. "Look at some of the games that are coming up - Accrington are going to Wimbledon on Saturday, Portsmouth are playing Accrington next week, Oxford v Plymouth - they're all going to cut their own throats," he said. "I don't see a team sticking 10 wins on the bounce again between now and the end of the season. "We've got Cambridge coming up who fancy getting into the play-offs, Carlisle on Saturday, and even down to the likes of Luton - there's going to be some tough games coming up for everybody."